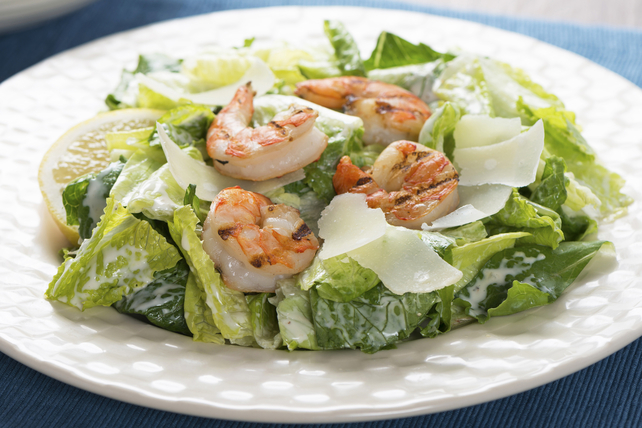 Chipotle-flavoured grilled shrimp add the perfect finishing touch to this simple, yet oh-so-delicious, Caesar salad. Toss shrimp with hot sauce in medium glass bowl. Refrigerate 30 min. Heat greased barbecue to medium-high heat. Thread shrimp onto 4 skewers; grill 4 to 6 min. or until shrimp turn pink, turning occasionally. Toss lettuce with dressing; place on 4 dinner plates. Remove shrimp from skewers; place on salads. Top with cheese. Serve with lemon wedges. If using wooden skewers, soak them in water 30 min. before using to help prevent them from burning on the barbecue. Serve topped with whole grain croutons or crostini.